The New Savages are an electric and original take on the Delta Blues. Lead singer Milan’s striking baritone vocals evoke the spirit of a great poet. His guitar playing is a simple, primitive and hypnotic boogie – one that sounds as though it was developed at the dawn of time. In the middle of a 22 date national tour centering mostly on connecting with Australia’s more remote and rural communities, The New Savages will be appearing for the first time in Milang. This Sunday afternoon show ends the South Australian leg of their tour, coming off the heels of a performance at the Mt Gambier Fringe Festival and Adelaide. Over the past few weeks they’ve also been recording their debut album “Seventh Son” which will be released in the coming months. Hot off the recording sessions they will be performing some brand new material for their Milang audience. 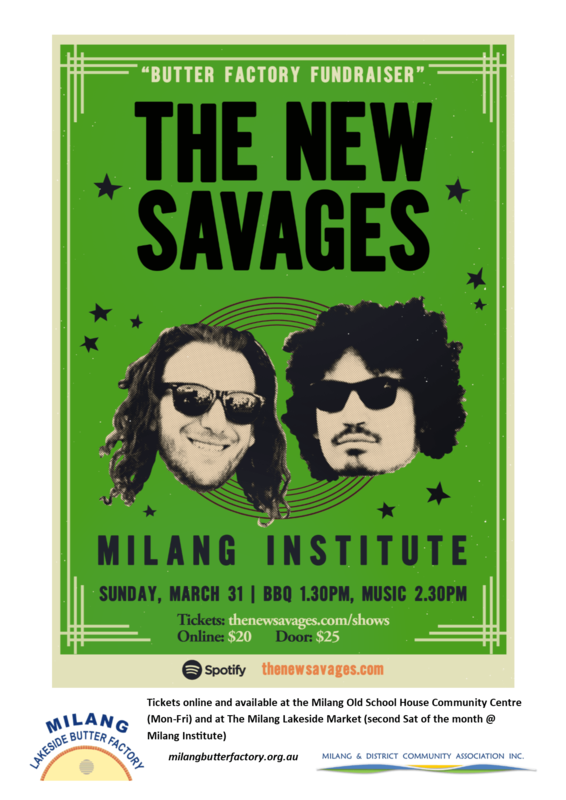 Sunday Afternoon, March 31st The New Savages will appear at Milang Institute. They’ve partnered up with the MOSHCC to put on a fundraiser for a restoration of the Milang Lakeside Butter Factory – So come down for a BBQ, a unique blues experience and contribute to a good local cause. BBQ kicks off at 1.30pm. Music at 2.30pm. Tickets are $20 online and $25 on the door.